In a personal account of Sally Clark's successful appeal against her conviction for murder of her sons, a BBC Two documentary examines the problems faced by doctors in determining the cause of death in babies. Two weeks ago, Stephen Clark tidied away his four-year-old's toys and frantically cleaned the bathroom. It was the night before his wife's appeal at the High Court in London and, in the event of Sally returning home, he wanted the small family house to be as neat as a new pin. This was the first time he allowed himself the luxury of imagining life as a family again - for the couple had been at the appeal court before and lost. This time, though, things would be different. Despite the fact his trust in the judicial system had been worn threadbare by their ordeal, he was optimistic that he would leave the court with his wife by his side. "We don't need luck," said Mr Clark, pacing outside Court Room 8. "We need justice. I just want to take my wife home and be a family again." Sally Clark's father, Frank Lockyer, was devastated by her conviction. And he did. On the second day of the appeal, Sally's convictions were quashed, after it was revealed that the Home Office pathologist, who examined both her sons after their deaths, had failed to disclose vital information to other doctors involved in the case. 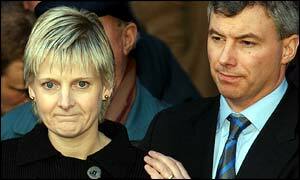 But pathologist Dr Alan Williams was not alone in securing Sally's wrongful conviction. A BBC Two documentary, Cot Death Mothers: The Witch Hunt, investigates the role retired paediatric professor Sir Roy Meadow plays in both our criminal and family courts up and down the country, and reveals how his mistakes are costing families dearly. An expert in child abuse, Professor Meadow coined the phrase Munchausen's Syndrome by Proxy, when investigating parents who inflict illnesses on their children in order to draw attention to themselves. He went one step further in cases of cot death and, in what is now known as Meadow's Law, cited: "unless proven otherwise, one cot death is a tragedy, two is suspicious and three is murder." Cot death mothers who find themselves in the same circumstances as Sally Clark come under suspicion because their babies have died mysteriously. They cannot prove their innocence because even the doctors do not know why their babies died. Thanks to Meadow's Law, arrest and conviction are a real danger. Epidemiologist Professor Jean Golding at Bristol University would rather Professor Meadow did not give evidence in court. She told the BBC: "So many people have doubts about his evidence that it is a very dangerous thing to keep doing, his personality is such that he sways juries. "It's not the science that sways them. I think it's just his persona." Today is not a victory. We are not victorious. There are no winners here. Science, too, is one step ahead of Professor Meadow and is working on the opposite theory - that in fact the more cot deaths a mother suffers, the more likely it is that she and her babies suffer a genetic condition. Dr David Drucker at Manchester University has identified a "cot death gene". Geneticists and biologists like him are working on the theory that cot deaths happen because the babies' defences against infection do not kick in when the mothers' own defence system in their blood fades after eight weeks - leaving them vulnerable. However, in a statement to the BBC Professor Meadow said: "The media is more eager to publicise the dangers of perverts in the park, rather than face up to the uncomfortable fact that most child abuse occurs in the home and is perpetrated by the child's parents or carers." Meanwhile, Sally Clark, who served three years in prison for a crime she did not commit, is getting used to life in a home she has never seen and with a four-year-old son whose birthdays she has missed. On the steps of the High Court, looking pale and gaunt, she addressed the waiting media. "Today is not a victory. There are no winners here, " she said. "We have all lost out." Cot Death Mothers: The Witch Hunt was on BBC TWO on Thursday 13 February at 2150 GMT. The programme will be streamed from this page shortly. "The terribly bad dream became a nightmare when we were arrested on suspicion of murdering Harry"
"When the verdict came in it was as much as I could take and it's not easy to go through it again now"